You may not believe it when I tell you this, but I’ve never made a traditional cheesecake before this one. Maybe it’s because I’m not actually a fan of cheesecake… or cream cheese for that matter. I know, I must be nuts! It really wasn’t until I went to Disneyland Paris and was served a mini cheesecake with my dinner that I started to think differently about cheesecake. This cheesecake had a thick graham cracker crust, a sweet creamy center and was covered in a raspberry sauce that was insanely good. All three together was amazing! So, when I was invited to be a part of National Cheesecake Day with some of my food blogging friends I figured this would be the perfect opportunity to make my very first traditional cheesecake! A Very Berry Cheesecake! Because I love chocolate and the commissary finally started carrying chocolate creme OREOs, I decided I wanted this cheesecake to have a chocolate crust. Seriously, who doesn’t love a chocolate cookie crust? And then to top the cheesecake, I wanted to try and replicate the tart, sweet flavor of the berry sauce that I had on the cheesecake in Paris, so I made a chunky raspberry & strawberry sauce to pour over each serving of cheesecake. The filling of the cheesecake comes from a recipe I found on Simply Recipes. I’m not even going to rewrite the recipe for you, I’m just going to let you head on over there and use their directions and tutorials. It’s amazing. Simply Recipes has provided a lot of pictures and very simple instructions. I felt confident as a first time maker of cheesecake that I could “get it right” with this recipe! The only difference is that I used a 10in springform pan instead of the 8in or 9in their recipe calls for. I really wanted each bite of cheesecake to have the flavor from the berry sauce, because to me that was the best part of the cheesecake… the contrast between the creamy smooth of the cheesecake and the tart and sweet of the fruit. Add the crunch of the crust and WOAH… perfection. I think that this cheesecake has made me a believer. A cheesecake believer, that is! 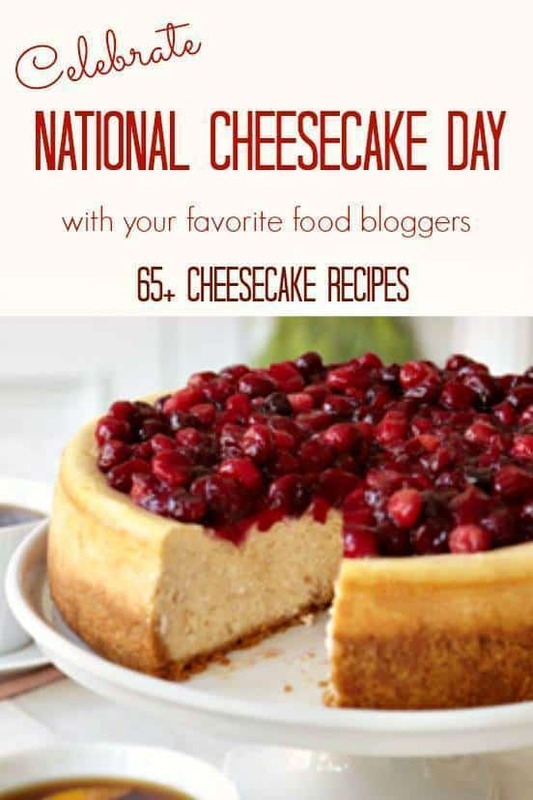 If you’re a cheesecake lover, you’re going to want to check out all of these other amazing bloggers and their cheesecakes! We’ve got bars, cakes, pops, and so much more! I can’t wait to check them all out myself! In your food processor, pulse the cookies until you have a finely ground consistency. Pour in the sugar, salt and melted butter. Pulse again until a dough forms. Scrape the sides and bottom of the processor to make sure everything has been incorporated. Prepare your springform pan according to the directions found in this recipe from Simply Recipes . Press the cookie mixture evenly into the bottom of the prepared 10in springform pan. Bake for 13 minutes. Remove from the oven to cool. Reduce heat in the oven to 325F degrees. Prepare, bake and chill the cheesecake according to the instructions on the recipe from [Simply Recipes] in the 10in springform pan with the Oreo crust. In a large pan, combine the raspberries, sugar, vanilla and salt over medium high heat. Smash the raspberries until no more pieces remain. Cook until the mixture begins to simmer and bubble. Stir constantly and cook for about 5 minutes or until the mixture begins to thicken. Remove from the heat and press the mixture through a metal/mesh strainer into a bowl. They object of this is to remove the seeds and any chunks so all that's left is a sauce. If the sauce is too thin, meaning if you dip your finger in it none stays on your finger, return it to the pan and cook on medium high, bubbling, until it's thickened to your desired consistency. Don't reduce it too far, you want as much of this delicious sauce as possible! Set the sauce aside to cool completely before using. Cut a slice of cheesecake and put it on a plate. Spoon the raspberry sauce over the top of the cheesecake. 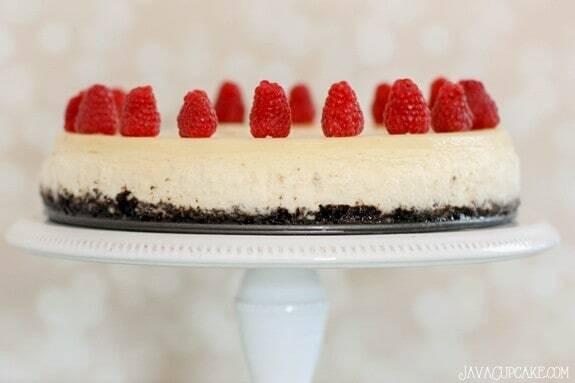 Garnish the cheesecake & plate with fresh raspberries, blackberries and blueberries. Store the sauce & cheesecake covered in the refrigerator up to a week. I am lurvingggg all that berry sauce!! Pinned! 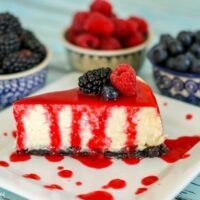 Oh, how I love a berry dessert and your cheesecake is NO exception! YUM! I believe in cheesecake!! 😉 Great recipe my friend! Okay, this is your first cheesecake ever??? Either you have mad skillz or a fabulous case of beginners luck. (I’m guessing the former.) My first cheesecake looked like the grand canyon. Love the oreo crust! Unexpected on a berry cheesecake! Yum! Well… I made a peanut butter one before, but I don’t count it because I don’t think it was very cheesecakey. This is my first traditional-style cheesecake baked in a waterbath and everything!! I think it was beginners luck… since I seriously had no idea what I was doing!! HAHA! 🙂 THANK YOU for your kind words though!! This is your first cheesecake? Really! Oh my goodness! How I envy you! It turned out so beautiful I thought you have at least 50+ cheesecake under your belt! Thanks for joining us today to celebrate this delicious day! It really has to be perfect cheesecake for me to want it. Some are so dry it’s just a waste of calories! That’s why homemade is better and oh my gosh this looks SO freaking good Betsy! Pinned! Thanks Dorothy! I’ve never been a fan of cheesecake, but I ate three slices (not all at once of course) of this cheesecake! So moist and delicious! Thanks for the comment love today! Hi, Betsy!This is pure temptation from top (berry topping) to bottom (Oreo crust). Ooooh Denise… I love the way you put it! Pure temptation is right!! Thanks for stopping by today! It’s hard to believe that this is your first cheesecake! It looks perfect! I know, right?!?! I can’t believe it turned out so well for my first time around! Thanks for the comment love today, Jessica! What a gorgeous cheesecake, I love all the berries on top! I am all about that berry sauce!!! YUM. My daughter said I need to make it again so she can pour it on toast in the morning!! The berry sauce is SO GOOD! Thanks for stopping by the blog today Aimee! I want a good ole slice of this for lunch!! Love love the toppings and that crust! Well, your first cheesecake is beautiful! I love the way you arranged the berries around the top of it, and the berry sauce dripping down the sides looks so pretty, and tempting! Thanks, Sue! 🙂 The berry sauce was probably my favorite part!! Another gorgeous dessert! 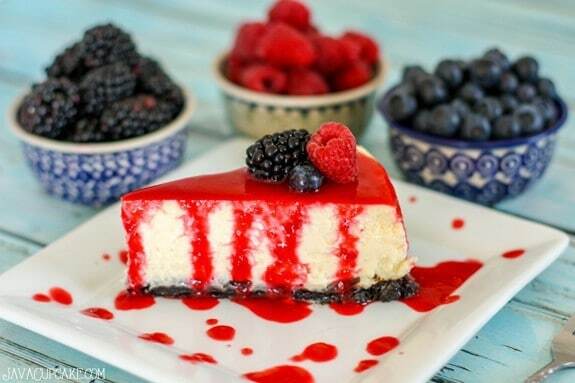 I adore cheesecake and berries together! Pinned. I love your cheesecake – simple but perfect! That berry sauce looks awesome – I’d eat that plain!! Pinning! Happy Cheesecake Day! I am so glad you are on board with cheesecakes now! They are truly glorious! This one looks awesome! What a gorgeous cheesecake! I love the berry sauce coming down the side and it’s so perfectly tall! Welcome to the dark side of cheesecake lovers 😉 can’t go wrong with a classic berry cheesecake! I love fresh berries, especially with dessert. Your cheesecake looks delicious! 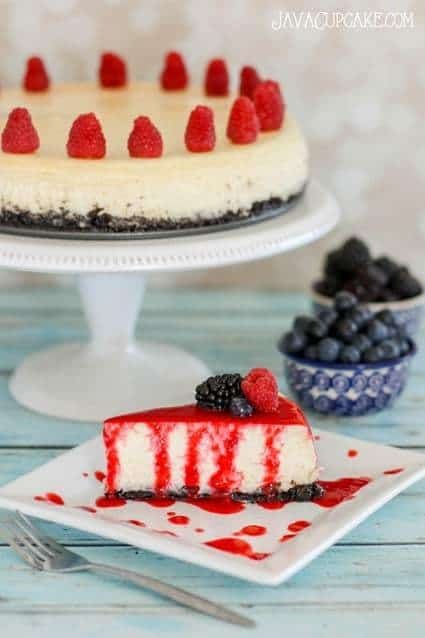 Love the fresh berries with your gorgeous cheesecake. Thanks for sharing a great recipe!! I’m glad you’ve been converted because this cheesecake looks yum! First time! No way! This looks so amazingly perfect! Great job on it. Are you hooked now? Your very first cheesecake and it’s a masterpiece, Betsy! I admit, it’s been a long time since I’ve tackled a whole, no-crack cheesecake myself. Love that sauce–it’s great to be celebrating with you! This is a beautiful cheesecake – I would never know it was your first time making one! Looks delicious! WOW! you totally won big on your first cheesecake ever! I’m totally impressed! PINNING! Such perfection for the first time! And great minds think alike! I added an Oreo crust to mine too, and it was AWESOME. 🙂 Pinning this! That berry sauce! Be still my sugar lovin heart! 🙂 Such a crazy good cheesecake, and your first ever?! You are the bomb dot com! Pinned!